Mrs Bella Disu, the former Executive Director at Globacom Limited has become the Executive Vice Chairman of Nigeria’s Second National Operator founded by her father, Dr Mike Adenuga Jnr. Adenuga’s daughter stepped into her new role this month officially making her the telecom’s company’s next-in-command to her father who is the Chairman. Dr Mike Adenuga, Chairman, Globacom Limited. Bella dropped the hint of her elevation at Globacom on her LinkedIn account where she updated her profile to reflect her new position as the telecoms giant’s new EVC effective January 2019. She takes on her new role after serving as Group Executive Director at Globacom, a position she has held since June 2004. The new Globacom EVC also performed her first major international assignment this month where she attended the ChooseFrance International Business Summit alongside 149 global leading CEOs in France. At the event, she announced tech deals signed by Globacom with French telecoms equipment supplier, Nokia Alcatel-Lucent and another French tech firm. Watch Dr Mike Adenuga Jnr receiving honours from Emmanuel Macron, President of France in Lagos. She holds a Bachelor of Arts degree from University of Massachusetts in Boston and a Master of Science degree from the Northeastern University, also in USA. 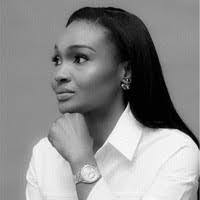 She is the CEO of Cobblestone Properties & Estate Limited and sits on the boards of Abumet Nigeria and Julius Berger Nigeria. Nigeria’s Globacom which launched its mobile telephony business unit in August 2003 under the Glo mobile brand, the number two largest mobile operator by customer base, now accounts for over 26 million active phone connections in the country. The telecoms company’s mobile footprint has extended into Ghana where it operates Glo mobile Ghana and also holds a record as the first single company to build a high-capacity submarine fibre-optic cable, Glo-1, running from the United Kingdom to Nigeria. The undersea cable has supported the attendant high increases in Internet speeds and download rates that resulted in significant improvements in online technologies, the company says.